Crypt of the Necrodancer is based on the classic roguelike style – you’re exploring a randomly-generated, tile-based dungeon, and enemies move each time you do. Except all that movement is set to a 8-bit techno/disco soundtrack. The dungeon setting and the enemies you’ll be facing should all be familiar to you if you’ve ever played a fantasy RPG before, but the inclusion of rhythm game mechanics puts an inspired spin on the genre – and it works beautifully. 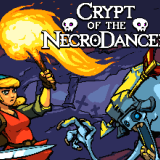 I’ll admit, I’m usually not a fan of rhythm games, but Crypt of the Necrodancer is an exception. While most games like Dance Dance Revolution or Guitar Hero have you hitting the correct notes at the correct time, this one only requires you to match the beat. You have complete freedom to explore at will. 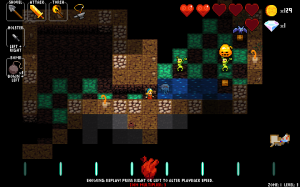 While most roguelikes are turn-based, giving you time to plan out your attacks and select from a typically wide selection of skills and items, here you’re forced to keep moving. Since you’re trying to keep up with the tempo, you’re forced to think on your feet, and those hasty decisions will probably kill you more than a few times. 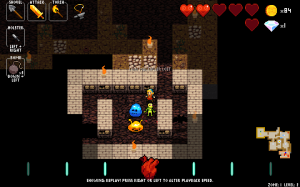 In the tradition of some other great modern roguelikes, such as Spelunky, death is frequent, but restarting is quick. You can quickly jump back in and try again, and thanks to the variety in the random generation, your next run is just about guaranteed to be different. The variety helps the game feel less frustrating. The controls are (thankfully) simple, only requiring the arrow keys. 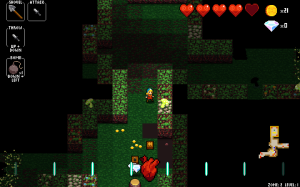 You can move in four directions, and move towards an enemy to attack them (as long as they’re not moving towards you). Your items are tied to two-button combos. Still, this game is anything but easy. There’s a variety of enemies to learn the movement patterns of, and plenty of weapons that affect your attack range as well as damage. You can import your own MP3s to play along to, but the system isn’t quite perfect. You’ll need a pretty beat-heavy song for the game to pick up on the tempo accurately, and even some of the techno tracks I found just weren’t as good as the game’s own soundtrack. The songs in the game are catchy and have a consistent beat, making it easy to keep in time. Each time you progress to a new floor, the music will change, and you’ll have to adjust yourself to a faster or slower tempo. If the fast-paced rhythm gameplay seems daunting, you can play as Bard and go through the game at your own speed, with enemies only moving when you do. Other characters, with their own gimmicks and skills, can be unlocked as you progress. 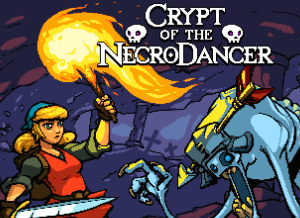 There’s a lot to explore in Crypt of the Necrodancer, and everything about the game is polished – from the retro art style, catchy music, and even fully-voiced cutscenes. You’re going to die – a lot – but like a favorite song you can’t get out of your head, you can’t help but keep playing it on repeat. Crypt of the Necrodancer is available now on Windows, Mac and Linux via Steam.